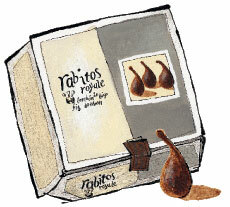 Rabitos Chocolate Figs for sale. Buy online at Zingerman's Mail Order. Gourmet Gifts. Food Gifts. 9am - 10pm ET We're open now! and pay only $10.99 per address. Lynn Fiorentino is the assistant to Zingerman's Co-founder Paul Saginaw and Zingerman's Mail Order Partner Tom Root. She has worked at Zingerman's for over 20 years and has eaten a lot of amazing food. These figs are the best combination of fruit and chocolate that I have ever had. The figs themselves are luscious, rich, and full-bodied with a gentle sweetness. Their scent may be difficult to place at first, until you remember that they have been soaked in a liquer. The flavor it imparts is subtle, though it adds another layer of richness without being noticeably alcoholic. The outer layer of chocolate is soft and also very deep, and collaborates deliciously with the fruit. Together, the flavors and textures of these figs are succulent and lush. I think that they pair beautifully with a creamy cheese and a heavy red wine, though they would also be a wonderful replacement or even companion to chocolate-covered strawberries. My favorite way to eat them is alone in a room with my eyes closed. I like to be able to concentrate fully on every sumptuous bite. Prefer white chocolate? We've got white chocolate dipped figs, too! New foods, discounts, love letters. If you are not pleased with any aspect of your order, please let us know. We'll quickly replace it or refund your hard earned cash. And you never, ever have to return anything.